Some people, after suffering voice problems over a longer period of time, are confronted with the diagnosis of laryngeal cancer. While at an early stage there is a good chance of healing and being able to continue the previous live, sometimes the last chance is to remove the entire larynx. Vocal communication as usual is not possible anymore. The person has to learn to use a substitution voice, which sounds very different compared to a natural voice. The social stigma, which can go along with the medical situation, poses the danger to lead the person into social isolation. The estimated number of total laryngectomees is about 600.000 people worldwide and 21000 laryngectomees in Germany with about 3000 additional laryngectomy operations performed every year. 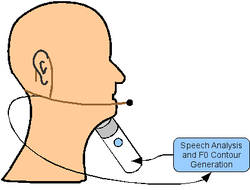 Specially for alaryngeal speech, one direction of research and practice is to find ways to replace the larynx with something that can take over the task that the larynx fulfilled, namely the production of voice and the switch between trachea and esophagus. While the possibility to reach this goal is still far away, the goal of this projects is to develop a new voice producing device that enable both female and male people to speak with a natural and intelligible voice. Creating good substitution voices still is a challenging task, in the framework of which only little progress has been made over the last decades. State-of-the-art devices still sound robotic and unintelligible. This project aims to add another step toward providing patients with tools that can help to improve their quality of life.